Pivotal Container Service (PKS) was announced in VMworld 2017 US. 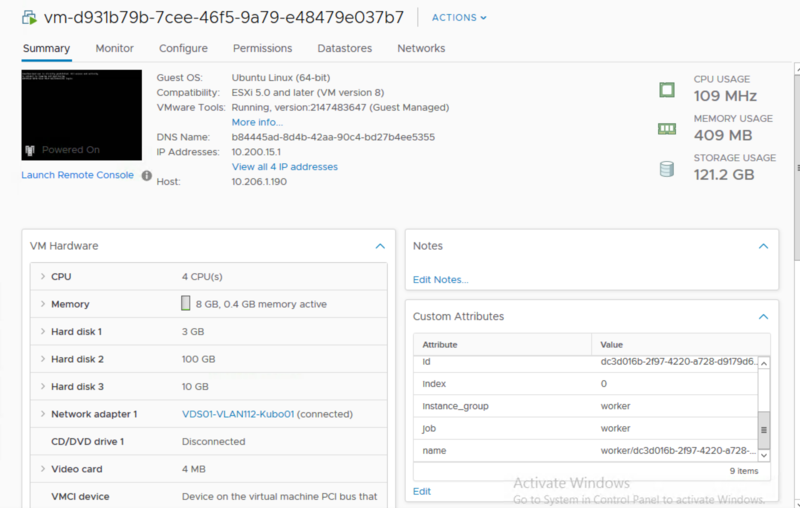 Its not GA yet but through the VMworld CNA sessions, I learnt that its going to use BOSH to spin up Kubernetes cluster, thus the name KUBO – Kubernetes on BOSH. Through my googling, I saw my fellow colleague Simon from Ireland had the same thinking and did a fantastic job in detailing in the installation steps required to get KUBO up and running. Below you can see the kubernetes cluster spun up by BOSH. I had to scale down some of the nodes due to the limited amount of Memory and Storage resources I had. Below show the vSphere resources. Almost consuming all resources on my 64GB RAM, 1TB Storage Host. The screenshot below shows the amount of storage those k8s nodes consume. This is the worker node. You can identify from the Custom Attributes. 121.2GB Storage Used. Ouch!